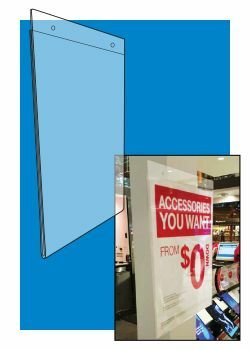 Wall Mount Acrylic Sign Holders | Retail Display Signage Hardware | Clip Strip Corp. 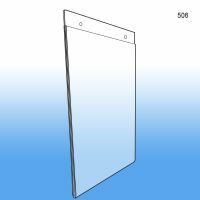 Available in 8.5" x 11" or 11" x 8.5"
Wall mount acrylic sign holders by Clip Strip are a widely used method of store communications. There are virtually no limits to this product's potential uses and they can be mounted via adhesive tape that comes with the product or with a variety of other fastener options, including with screws. 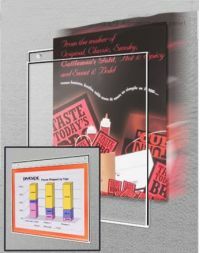 They can be seen at retail used on refrigerator doors, near pharmacy counters with announcements, by entrance ways and exits, on certain POP displays, etc. We carry a wide variety of acrylic sign holders to meet all of our customers point of purchase retail store equipment needs. If you require other wall mount sign holders, check them out on our site and keep in mind, we carry sign holders for virtually every corner of a store, warehouse or business.